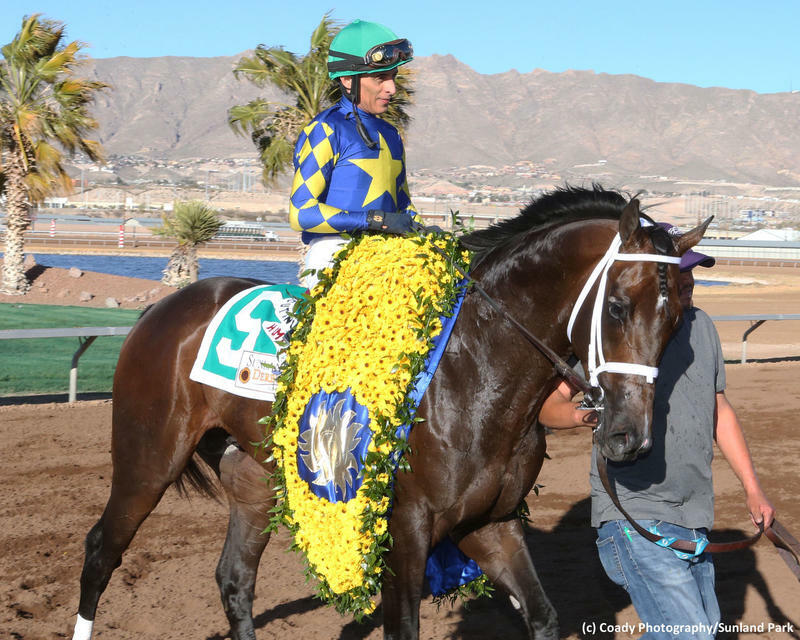 Starlight Racing's Cutting Humor earned 50 points on the Road to the Kentucky Derby following a hard fought, neck victory in the $800,000 Sunland Park Derby (G3) on Sunday. The dark bay colt endured 1 1/8 miles in a track-record 1:46.94 under the guidance of John Velazquez. Trained by Todd Pletcher, Cutting Humor was unveiled in September and ran in second throughout at Belmont Park in a 6 1/2-furlong sprint over a sloppy surface. He returned four weeks later at Keeneland in a two-turn route and tired late to third. It is worth noting that Holy Bull (G2) victor Harvey Wallbanger was the runner-up in that event. Cutting Humor concluded his three-race juvenile campaign with a victory at Gulfstream Park West in his first attempt with blinkers on, pulling clear late while closing swiftly in a one-mile assignment. The son of First Samurai ran a winning race in defeat in his 2019 debut. He was a clear second behind subsequent Fountain of Youth (G2) runner-up Bourbon War in an allowance event at Gulfstream Park, which led to a try in the Southwest (G3) at Oaklawn Park. In his graded debut, the colt made a nice middle move but was empty late in checking in seventh as the 2-1 favorite. The form line held strong once again, though, as third-place finisher Long Range Toddy came back to annex a division of the Rebel (G2). The Kentucky-bred upped his lifetime line to 6-2-2-1, $516,967 and now sits in fifth on the Road to the Kentucky Derby leaderboard. He has been much improved since the addition of blinkers and has posted triple-digit BRIS Late Pace figures (104-101-77-101) in three of his last four assignments. Cutting Humor was bred in the Bluegrass State by Dell Hancock and Bernie Sams, and he went through the auction ring on a pair of occasions. He attracted a final bid of $175,000 as a short yearling at 2017 Keeneland January prior to bringing the gavel down at $400,000 at the 2018 Fasig-Tipton Saratoga sale. He was produced from the unraced Pulpit mare Pun and is a half-brother to the stakes-winning Irish You Well. Pun herself is a half-sister to three-time Grade-1 winning sprinter and sire Zensational. This is a very good female family that is prominent with Claiborne Farm bloodlines. The improving colt took a big step on Sunday to throw his proverbial hat in the Kentucky Derby ring, but he still has much work to do. His current top BRIS Speed figure of 99 is below the better sophomores heading towards Louisville on May 4. In addition, Sunland Park has not been a venue that has produced consistent Kentucky Derby contenders. The six-week break from Sunday's win to the Run for the Roses is of concern to me, too. I have respect for Cutting Humor, as well as his top-class connections. However, he might be a notch below the upper echelon of his generation at this stage of his development.